Our core competency has always been machining power transmission components. Our CNC machining centers are state of the art. 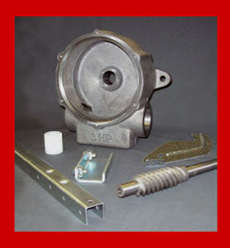 We work with virtually every material from plastic to stainless and brass to our core materials of cast iron and steel. In addition, we are able to bundle many diverse disciplines IN-HOUSE, such as CNC sheet metal punching and bending using Trumpf fabricators and precision brake presses, along with welding, assembly, stamping, precision grinding, and many more! This offers tremendous savings to the OEM looking for one-stop shopping for complex machined and fabricated assembly’s boxed and ready for shipment to their customers. We also offer these services individually at rates which are very competitive. We stock a selection of worm and planetary transmissions in a variety of gear ratios and horsepower capacities. Custom gears and sprockets can also be designed to your specifications. We would love the opportunity to show you what we can do for you!